Custom rugs are becoming increasingly popular. Usually, a high quality velvet pile carpeting is cut in various shapes and forms and pieced together to form an overall design. Use any variety of colors or pattern to mix or match with your room's theme. Recently, I had a custom rug made for a client that repeated the exact irises that were hand-painted on the drapery fabric. It's a wonderful but expensive way to pull together a room. The design concepts can come from a print on a sofa to a logo of a particular company. If it exists in design, it can usually be copied into a beautiful area rug. Those who come up with the custom rug design have a challenge to meet the specific needs of a client or customer. Many things are incorporated in this process including what size the rug should be, should it be free-formed or square edged, what design is best to enhance the current overall theme of the room, what colors should be used to compliment permanent fixtures such as wall paper and fabric design. What style of carpet should be used and can two or three different styles be incorporated to give the custom rug more of a 'custom' look? Style and dimension are achieved by not only the carving techniques used, but also by using carpet of varied texture and style. For instance, by using both a cut-pile Saxony and a Berber style carpet, you can develop a unique design that is naturally dimensional in style, which will contribute nicely to that one-of-a-kind look you've been striving for. The process that goes into making a contemporary or modern rug by hand is virtually the same process that is incorporated into making a custom rug. The main difference is in the overall design choices. In a contemporary rug, contemporary or modern design ideas are used in creating the area rug. In the custom rug design, any design concept can and is used in creating these beautiful masterpieces. 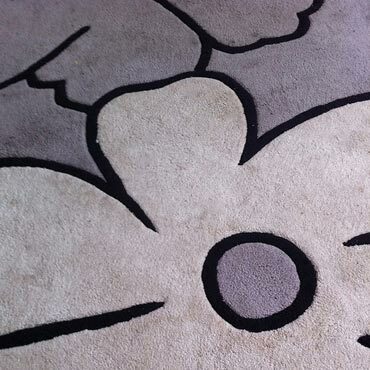 As mentioned earlier, a popular custom rug design is the company logo. Many companies use these to define their entryways and foyers with their company emblems and names. Not only does this make for a nice statement as well as good first impression, but also contributes to the personalized climate most business are trying so hard to accomplish. In the final analysis, custom rugs are definitely a mainstay in the area rug arena. And although machine made custom rugs are becoming more commonplace, there is no substitute for a quality, hand-made, custom designed area rug.